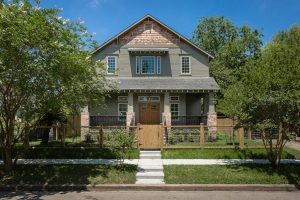 Brooke Smith is an area of the Heights with old Folk Victorian and Craftsman style homes. These are gorgeous when restored or remodeled. A lot of the older homes weren’t all that great to begin with, or have been too neglected to restore/remodel. These are the homes that are being demolished to make way for new homes. Land prices here are cheaper than the rest of the Heights, which also makes it appealing for builders. See recent post on Land Prices in Brooke Smith. When I last reported on Brooke Smith New Home Sales in 2015 they were a mix of new 1 story and 2 story homes, all on full 5000 SF lots. 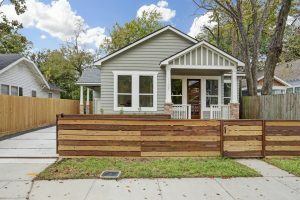 New 1 story homes are rare in the Heights; the land is just too expensive. Heights are being split and 2 homes built where one used to be. Tall-skinny homes are the norm in most of the Heights. Well, Brooke Smith now has some tall-skinny homes too. The table below gives new home prices in the area. These are active listings, not sales. This time, I divided the table into two groups: full size lots (5000 SF) and partial lots. 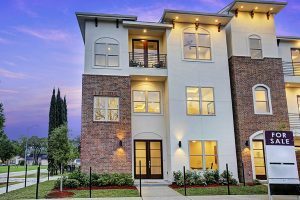 The photos below show examples of new construction Brooke Smith homes.